The Central Time Zone is messing with me. 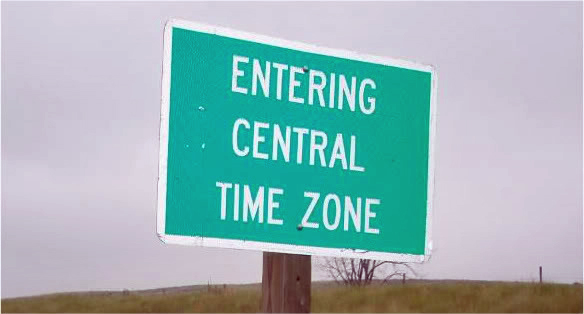 All my life I lived on the East Coast in what I naturally assumed was the correct time zone. Everywhere else in the world was ahead, or behind, but I was just right. Kind of like how the British drive on the ‘wrong’ side of the road and drink the ‘wrong’ caffeinated morning beverage. I’ve had plenty of experience with changing time zones in the past, but always via airplane. I’d step on one of those magical flying ships and exit in a different world and a different time. Adjusting was never much of a problem for me because everything was different. And because I expected everything to be different, all of those differences somehow seemed normal. I’d simply tough out the first day, get to sleep whenever the clock told me it was time, and by morning, I’d be right as rain. But driving isn’t at all like flying. You expect things to be mostly the same when you get out of the driver’s seat. You don’t expect your day to mysteriously lengthen to twenty five hours. And you don’t expect the Nightly News to come on at 5:30 PM, either. All of my adult life, Brian Williams, or Tom Brokaw before him, delivered the news sixty minutes later, at the proper dinner time hour. It was one of the known universal constants. You could literally set your watch by it. Now Brian is forcing early bird special meals on me. And it’s not just the nightly news. All of the shows I typically watch start and end an hour earlier here. It’s like the Central Time Zone is rushing me off to bed. It’s either puritanical, or evil, I can’t decide which. In either case, this single hour change is messing with me in ways that no overseas flight ever did. ← The Best Beach Anywhere? I so understand about the time zones. We do not ever change time in AZ (no daylight savings). I was in TX (which is an hr ahead) then the darn daylight savings kicked in. Now thats 2 hrs ahead, and I flew back to AZ 2 days later, took me a week to overcome that.